Some New LCP Photos of The Canada Shoe Porsche. 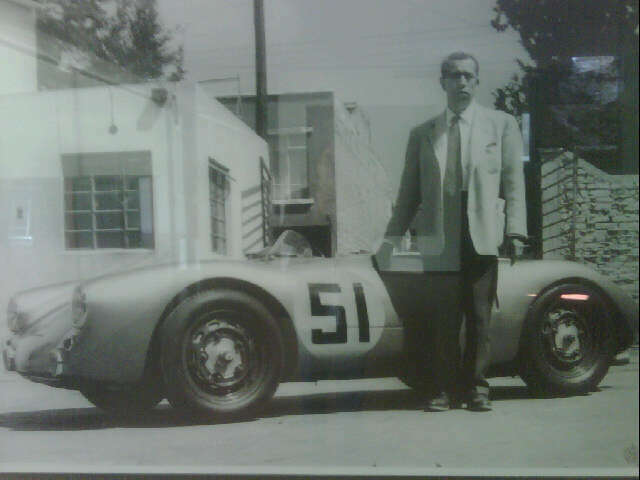 My very good friend Reno from Mexico has been invited to dinner by the relatives of the former Panam racer Salvador Lopez Chavez was was owner of the Canada shoe factory and the Porsche Spyder 550/001 shown in these never before made public photos. I have high expectations of being able to post more for my readers in the future. Gracias Reno! Let's Get Ready To Party!!! 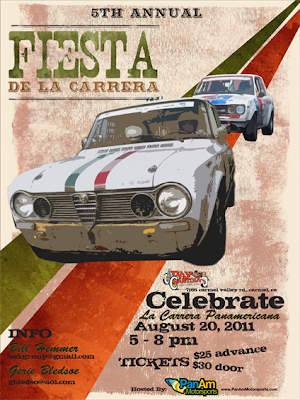 Each year the La Carrera Panamericana get together during the Monterey Historics weekend is a must do for anyone who has any interest whatsoever with LCP. Viva LCP! **LCP RULES – SLOW DOWN! The new city on the Carrera route for 2011 is Guanajuato (gwah-nah-HWAH-toh). Guanajuato is the capital of the Mexican state of the same name, which means “a place of frogs.” The city’s population is 76,900. Founded in 1548, the city of Guanajuato was designated a UNESCO World Heritage Site in 1988. The wealth of the city was based on extensive silver mines found under and around the city. In 1732, the Jesuits established a university in Guanjuato, thus establishing the city as a place of learning and culture. This area is known as the “cradle of Mexican Independence,” because the revolution against Spanish monarchy started here in 1810 in Delores Hidalgo, San Miguel de Allende, and Guanajuato. Guanajuato will be a challenge to Pan Am drivers because it is located in a steep valley. The streets follow the terrain rather than the normal Spanish grid pattern. In fact, the city features a maze of streets underneath the city that were built in old river beds. Participants in the first “Pan-Am Pre-Race Tour” will tour Guanajuato and nearby speed stages on Sunday, September 11. The Tour will focus on the entrance and exits to the city, and provide participants with an opportunity to check out the service area and learn how to get from the service area to the hotels after two or three margaritas. The Tour will also visit the famous speed stages on Mil Cumbres, have lunch in the Zocalo in Morelia, and be introduced to Queretaro, another city on the route. In addition to visiting Morelia, Guanajuato, and Queretaro, the Tour will include a relaxed introduction to San Miguel de Allende, and some of its race-car shops. The Pre-Race Tour is planned for September 8-12. The registration fee is $450 per person. Participants are expected to select their own airline flights, hotels, and airport transfers. Registration is open to anyone with an interest in La Carrera Panamericana or San Miguel de Allende and the surrounding area. Special training in Mexican stage-rally timing and rules will be offered on Friday, September 9. Competitors towing their cars or having them transported to Huatulco in October and other interested parties are invited to participate in the 10th Annual Coyote Convoy. The Convoy will leave Nuevo Laredo on Friday, October 14. It will stop for two nights in San Miguel de Allende, and will go on to Oaxaca for one night, before arriving in Huatulco on Monday, October 17. Each competitor will be asked to fill out the papers to have their race car and tow rig brokered across the border, instead of using temporary tourist permits. A procedure and forms for obtaining the necessary permits will be sent to all competitors soon. Following the end of the race in Zacatecas, the convoy will return to Nuevo Laredo to be brokered back across the border to the U.S.
Doug Mockett and Angelica Fuentes will return to Pikes Peak outside of Colorado Springs to defend their championship on June 26 in the famous “Race to the Clouds.” They will resume their friendly rivalry with local favorite Keith Davidson in his Falcon. Todd Landon and father-in-law, Vance Stewart, will also challenge the mountain in “Phatt Man,” a new purpose-built GT-350 Mustang. Pan Am/Chihuahua vets Jake Shuttlesworth and Tony Bogovitch will make the 12.4 mile run in their ’65 Ford Fairlane, while Jack Rogers, a Chihuahua and Bonneville vet will also have a run in a Mustang GT-350. Last but not least will be Hayden Groendyke in his fantastic ’49 Caddy sporting a FI 427 engine and modern running gear in the modified vintage class. Only a short stretch of the course is gravel. Suerte, y’all! The Organizing Committee issued the rules governing the race cars last week. The rules remain mostly the same as 2010, except that the fast classes will have their top speeds limited by requiring a combination of tires, transmissions, and rear end (differential) gears. The limitations apply to these classes: Turismo Production (144.6 MPH), Turismo Mayor (146.6 MPH), Sports Mayor (142.8 MPH), and Historic C (142.8 MPH). 144.6 MPH=232.6 KPH, and 142.8 MPH=229.8 KPH, according to the information provided by the committee. “Bag O Nails” is a 1966 Mustang GT 350 R clone maintained by Mustang guru Todd Landon with the intention of winning the Historic class on La Carrera and other events. The car was built from a bare shell in 2007 utilizing the very best of everything, and with the possibility of reverting to FIA homologation spec after the event. This car is simply the best prepared, fastest (420BHP) and most reliable Historic C Mustang alive, and is now for sale to a serious competitor. A lot of work has been done (weight reduction operation) to bring it to the highest standards. For more detailed info please phone or email. ’53 Studebaker Commander. $120,000. Finished to your specifications: color and FIA seats and racing harness fitment. This car won the La Carrera Panamericana championship in 2008 and qualified first in 2010. Finish will be as good/better than 2010. The car has been re-bodied and completely rebuilt since the 2010 event. It is now even faster and safer. The price includes a spares package and delivery/service is available. A build sheet is available. Completely Carrera-legal in all respects and guaranteed to pass all tech inspections. Needs nothing but you to win again. A rental arrangement for 2011 is a possibility. Contact Bill Beilharz, bbeilharz@aol.com or 602-320-5173 (Phoenix). Over $55,000 invested– asking $26,500. Photos and additional information are available at www.panamrace.com. Click on Classifieds. The advertisers assume all responsibility for their ads. 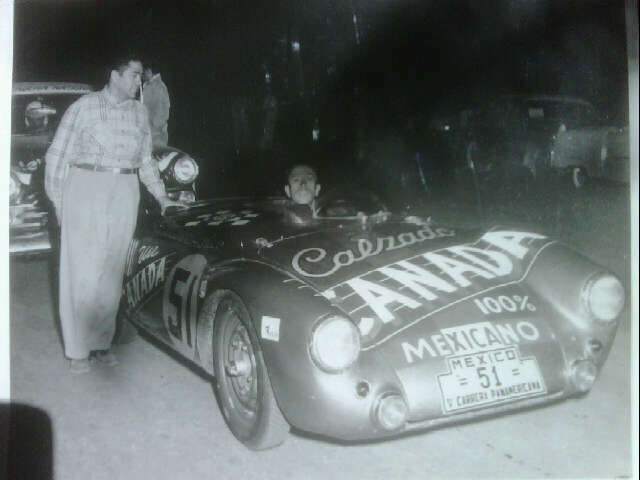 All forms of motor sports are inherently dangerous, and La Carrera Panamericana is no exception. It is a long, hard endurance race at high speeds along mountain roads. Mechanical failures are common, accidents not uncommon, and serious injury and even death are quite possible. Cars should be carefully prepared, with an emphasis on safety (brakes, seat belts, roll cage, etc. ), and driven prudently. Drivers and navigators should remember that the most important goal of this event is to finish. Unless you finish, nothing else counts.